in Social Media with tags #roastjoffrey, Game of Thrones, HBO Both comments and trackbacks are closed. To build anticipation for Season 4 of Game of Thrones, HBO and 360i are launching the first-ever social media roast for the show’s own King Joffrey Baratheon – the character the Internet loves to hate. In fact, among the top TV characters, our social buzz analysis found that King Joffrey was the most hated character on the Internet this year. Out of the total conversation around 35 TV villains, Joffrey was associated with the word “hate” 83,000 times – that’s 3.5 times more than the second-most hated character of 2013, Walter White, and approximately three times per hour for every day this year. That’s a lot of hate. 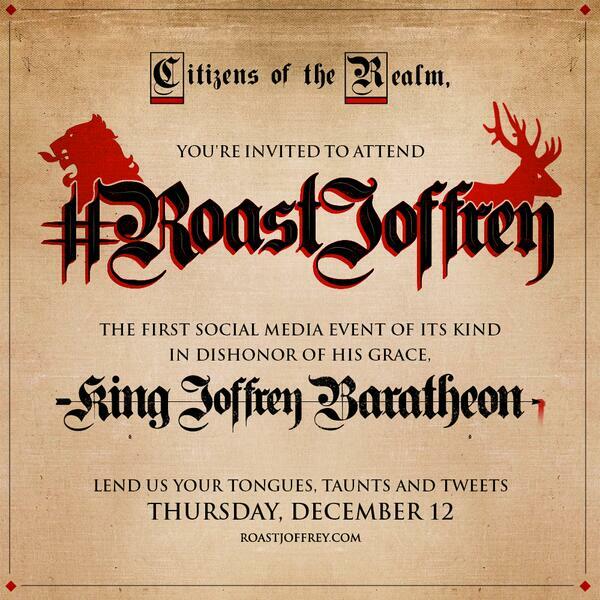 For the two day roast—happening today and tomorrow—Citizens of Westeros are invited to come together and vent their Joffrey frustrations with fellow fans and talent including series regulars such as Hodor (Kristian Nairn), Arya (Maisie Wiliams) and The Hound (Rory McCann), celebrities and social content creators. The @GameofThrones handle will host and moderate the live event, and all #RoastJoffrey content, punch lines, video and worst-of moments will be curated into a single feed capturing the experience at RoastJoffrey.com. In addition, HBO representatives at eight colleges nationwide including USC, Georgia Tech and Florida State, will host study break pop-up roasts where fans can film and contribute content “from the throne” that is uploaded directly to the event, along with other on-campus activations. Follow the almighty roast host @GameofThrones, send us your best jabs using #RoastJoffrey and see it all come together—tweets, pics, Vines and posts—on RoastJoffrey.com.